Vive la France, Happy Bastille Day! The fourth of July festivities may be over, but today we commemorate the end of another monarchy. It’s the day we remember the storming of the Bastille and the start of French Independence. It’s a celebration of French culture and a perfect excuse to take a break from, well everything and indulge in lots, and lots of French wine. And with so many amazing French wines yet to be discovered, this holiday couldn’t be a better time to explore. So try breaking away from the traditional celebratory glass of Champagne and let your palate lead the way. If you’re up for the challenge, get a little adventurous with a glass of Crémant de Bourgogne and for our red wine drinkers, maybe a yummy pour of Cotes du Rhone or Chinon. If you can’t make it to France for Bastille Day this year, no worries, there are tons of fun parades, festivals, and special events honoring the French national holiday that do not require a passport. In fact, if you’re in the Bay Area, don your most festive French wear and swing by Belden Place, our mini French Quarter in San Francisco and enjoy a day filled with good libations, delicious foods, live music and more! So with our glasses raised high...Joyeux Quatorze Juillet! 5 Amazing Coastal Drives: Happy World Oceans Day! Right in Robin’s backyard in the Central Coast, with iconic sights including, Point Lobos, Carmel, Monterey and the renowned Bixby Bridge, there’s plenty to see and do up the coast of Highway One. In fact, make a pit stop at one of the many restaurants Big Sur offers, grab something to eat and toast to the amazing views with Truvée wines, you'll be driving past our prestigious vineyards along the way. Down in the magical land that Andréa grew up in, separating the Pacific Ocean from the Hauraki Gulf and the Firth of Thames, the Coromandel Peninsula is a world famous drive because of its white sand beaches, inherent forest, and the Cathedral Cove. 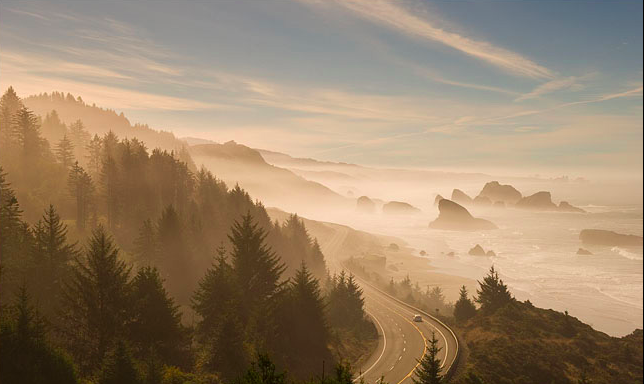 Bordered by the evergreen forests, Oregon’s Coast is one of the most desired routes to travel in the United States. From the famous Haystack Rock that erupts 235 feet above Cannon Beach to the scenic corridor of Cape Sebastian, this seaside favorite makes for one beautiful drive. The majestic beauty of this Mediterranean gem is exactly why Corsica Coast Road is on the list. With so many splendors it’s hard to focus on just one. While driving up the Amalfi coast, take a moment to appreciate the Santiero Degli Dei, also known as ‘The path of the Gods,’ which is said to be the single most stunning view on the drive, where the Sorrentine Peninsula meets the Mediterranean Sea. Pinch Us!! The McBride Sisters Are in Oprah Magazine!! What can we say other than ... THANK YOU GAYLE KING!! What an amazing honor to be featured in Oprah Magazine and have our McBride Sisters story told. We're still speechless and feel so blessed!